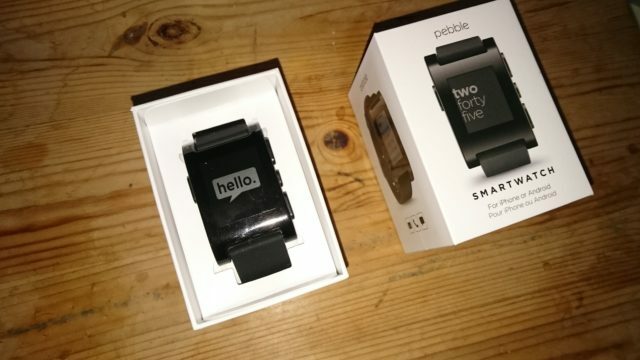 The Pebble will be delivered in a small box similar to other wrist watches. As part of the delivery you will find the watch and besides that an USB charging cable and a small instruction about how to set the watch up. A power supply is not provided. 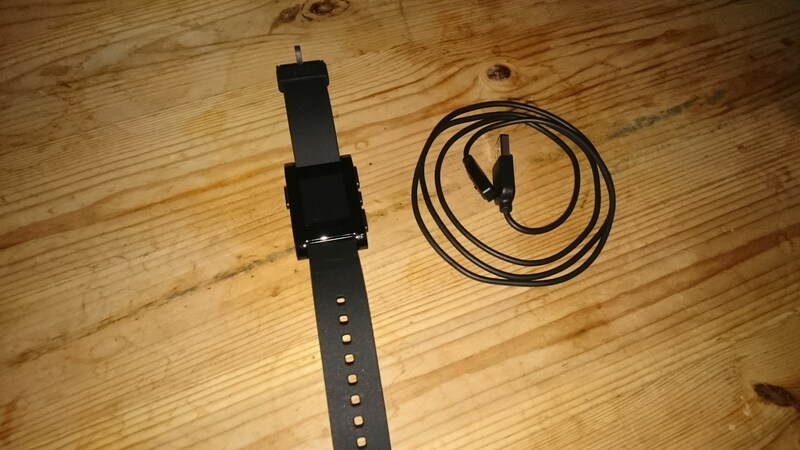 The charging cable is a special construction for the pebble: an adapter with spring loaded pins sticks to the watch at the side with the help of two small magnets. The construction is build with a protection against reverse connection – you can not put the cable on in the wrong way. An advantage of this construction is that the watch is completely water resistant, which is not the case for most other smartwatches. If needed you can buy the charging cable separately. You should just take care to get an original part since the cheap replica by third party manufacturers often use much weaker magnets and don’t stick to the watch very well. A big advantage besides the water resistance: the battery lasts about a week depending on the actual use. In newer models by other manufacturers like the Apple Watch or Moto 360 you usually have to charge the battery every day. Due to the long runtime with one charge one can assume that the battery will be usable at least 7 years when you take 70 charges into account and about 500 charging cycles for which the battery is designed to. Even if the battery should not work any longer one day it is at least possible to fix it as Pebble added some screws to the back after the critical report by iFixit so you can open the case without destroying the watch. 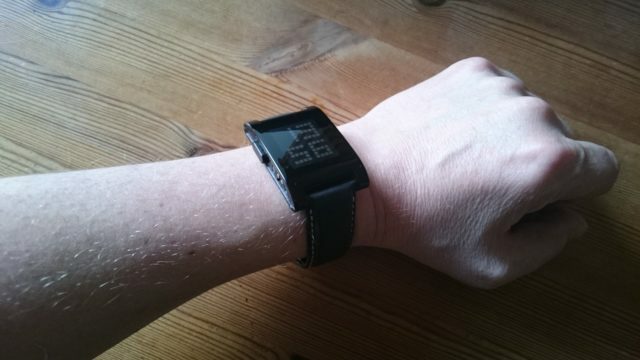 The provided wrist band is functional but not premium quality: rubber with a metal buckle. After a few days I found it quite awkward to wear. However it can be replaced very easy since it is attached using regular spring bars. Therefore any wrist band with a width of 22 mm will fit. I’ve put on a water resistent wrist band “Mariner” by Hirsch. Due to its shape the watch looks quite big, at least on my wrist. But this can be mistaken: in fact the Pebble is not much larger than the most digital wrist watches and with 11.5 mm not very thick in comparision. For example, a Casio WV-59DE-1AVEF wrist watch with integrated time signal receiver is 12.5 mm thick and significantly heavier. The operation is done using four buttons: Three buttons on the right side for “up”, “down” and “select” and a fourth one on the left for “back”. There is no touch screen but a positioning sensor which can be used to activate the background lighting with a flick of the wrist. Some apps also use the sensor for the control of specific functions. There is a vibration motor for notifications which I always perceived quite well. A sensor for the environmental brightness ensures that the background lighting is not activated during daylight. This function can also be disabled. Another feature is an electronic compass. However to be able to use this practically you also have to install an app on the watch like compass. To set the watch up you connect it to a smartphone using Bluetooth after you have installed the app by Pebble on the phone. You can either use Android devices as well as an iPhone. After establishing the connection for the first time the app on the smartphone will check if the firmware of the Pebble is up to date and will update it if needed. This will take a couple of minutes over the Bluetooth connection. Afterwards you can install additional watchfaces and apps on the pebble. Even when no connection is possible to a smartphone the Pebble is generally usable – especially basic functions like the time display or the use of installed apps like the stop watch or the timer are always possible without an active connection to a smartphone. To save power you also can always turn off the Bluetooth connection manually on the Pebble. First of all the Pebble is a wrist watch which is emphasized by the design. For the display Pebble uses a transflective “memory LCD” by Sharp with a resolution of 144×168 pixels. This display only requires very little energy (according to the manufacturer just 60 µW) so it is turned on all the time and you can always read the time without active background lighting. If needed pressing the “back” button on the upper left or a flick with the wrist will activate the background lighting for a few seconds. One of the big differences to regular wrist watches is already noticable: the freely adjustable display with different watchfaces. There are already three variations provided for digital and analog display like “Simple Analog”, “Sliding Text” and “Tictoc”. If you like to you can also try out different alternatives or create your own watchface using the SDK by Pebble. At the moment I use “Zoooom” – a zoomed display of an analog watchface which only shows the hour hand and indications for every quarter of an hour. Another variation which I also gladly use from time to time is “White Pixels” with the display of hours and minutes as a grid of pixels. Additionally there is a huge collection available from which you can install watchfaces using the smartphone app. Another very useful function which is also integrated is the remote control of music playback on the smartphone. You will see the information about the current title in the display and you can not only change the title and start or stop the playback but also control the volume on the Pebble. Besides the display of the time a major feature of a smartwatch is the forwarding of notifications by the smartphone. So you can see on the watch if someone is calling and can keep the smartphone silent in your pocket to avoid disturbing others by calls. Also new e-mails and short messages will be displayed if needed and you can decide if you reply immediately or later. As the first lines of the message are displayed you usually don’t have to pull the smartphone out of your pocket. For some notifications like for example short messages you can reply directly on the Pebble using templates without using the smartphone at all. Additionally there is also the possibility to install any kind of applications. For example besides the stop watch and timer you can also use the compass for orientation or control the camera of the smartphone with a live preview on the Pebble. The buttons for “up” and “down” can also be configured as quick start buttons which start specific applications when pressing and holding them. At the moment I use one button to start the remote control for the music player and the other one to start the compass. With the “Pebble Time” a new model was introduced in 2015. Besides the color display this model also contains a new version of the Pebble OS. By the end of december 2015 this version was made available as an update for the older Pebble models as well. It will be installed when using the “Pebble Time” version of the smartphone app. A special feature of this version is the “timeline” view which shows upcoming events in the future as well as old entries in the past using the two buttons on the right side. As a standard the daily time of sun rise and sun set will be added to the timeline together with a weather forecast for the day. Additionally there will be appointments from selected calendars on the smartphone and entries by apps like “Battery+” with the notification about the time when you should charge the battery again. Using the select button you can show more details and possible actions for the individual events and also turn off future entries for the specific app. The number of installable apps and watchfaces is not limited to 8 any longer. If there is not enough memory left to use a specific app other apps or inactive watch faces will be swapped out to the smartphone and automatically loaded again if needed. The sort order of the entries in the app menu can no longer be modified on the Pebble itself but only in the smartphone app where you can touch and drag entries in the list. Only the menu item for the system settings is always the first entry in the list on the Pebble. The remote control for the music playback on the smartphone automatically uses the active player. You don’t have to select the player in the smartphone app any longer. However you may have to start the player on the smartphone first before you can control it. Also the handling was changed: you don’t have to press and hold the “select” button to change to the volume control. Instead a single short press of the button changes the mode. To start and stop the playback you have to press the button twice. As standard for notifications now all applications on the smartphone are selected. You can disable specific apps on the Pebble itself or in the list in the smartphone app. In the previous version you had to select the apps manually of which you want to receive notifications. This could lead to the situation that you missed notifications even if you want to get them. The brightness of the background lighting can now be adjusted in four levels as well as the duration between 3 and 8 seconds. There is a new optional activatable “standby” function: if the Pebble is not moved for more than 30 minutes (for example if you put it to the side when going to bed) it will disconnect from the smartphone and turn off the Bluetooth connection to save power. Notifications by the smatphone will not be forwarded then as well. As soon as you move it the connection will be established again. The Pebble is only slightly larger as conventional digital wrist watches and very light. You can always read the time. The Pebble is water resistant. One battery charge lasts at least multple days, often more than a week. There are real buttons for the operation which are much easier to use as a touch screen in many situations. Another advantage is the open architecture and the universal connectivity: it does not matter if you use an Android device or an iPhone – both platforms are supported and some people even created support for Windows Phone or Blackberry. You can create your own apps using the free SDK. I did not regret the purchase of the Pebble and will gladly use it longer. If you prefer a color display and a more compact shape with otherwise the same properties the “Pebble Time” with a transflective color display and a microphone for speech input may be an interesting although quite more expensive alternative.